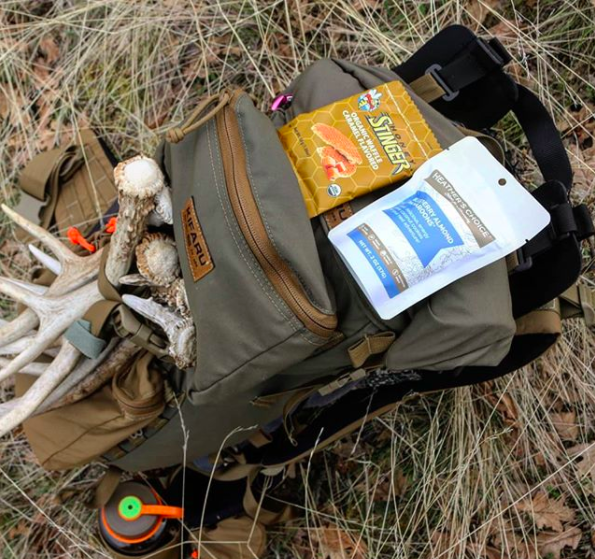 If you're a long-distance runner, hiker, or any kind of endurance athlete for that matter, you know that tasty and filling snacks are very important. A good snack can help repair your muscles, keep you from crashing, and keep up your energy when you're in the middle of an especially long run or training session. It also helps that everything magically tastes a million times better after you've physically exerted yourself. 1. This dark chocolate chip and peanut butter Perfect bar that's totally free of preservatives. If you're a fan of nut butters and/or chocolate, then you'll need to exert some self-control when faced with a box of these bars. They're made with zero preservatives and emulsifiers, so they'll need to be refrigerated. Leave them out while you're on your workout, and they'll be perfectly soft and ready to be devoured as soon as you're back. Get an eight-pack from Perfect Foods for $24. Or get an eight-pack and pack of 24 of select flavors on Amazon for $24 or $55.93. 2. These salted toffee pretzel Protein Crisp bars that taste like rice crispy snacks. If you're lactose intolerant and most protein bars upset your stomach, Amazon reviewers agree this may be a good bar option. It's textured like a rice crispy bar, but made with less sugar, and way more protein (20 grams per bar, to be exact.) The Salted Toffee Pretzel flavor also has pretzel bites, is covered in almond bark, and could convincingly substitute a chocolate bar. Get a pack of 12 from Amazon for $21.74. 3. These chewable energy cubes that are packed with caffeine. 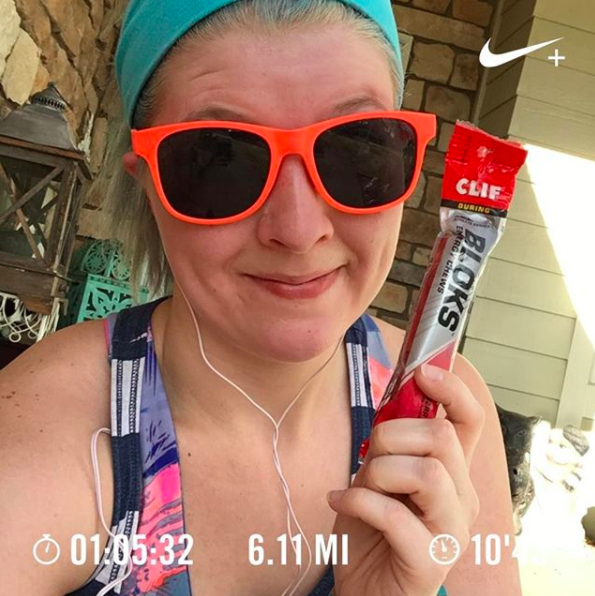 You can either chew on a few blocks before a long run, or carry them with you and pop them in your mouth mid-run. 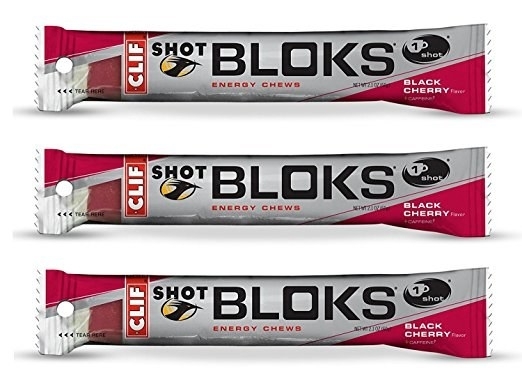 Each lil' block has 33 calories, and one entire pack contains as much caffeine as an ounce of espresso. And despite their plain packaging, they pretty much taste like candy! Get a pack of 18 from Amazon for $30.22. 4. These Keto-Crave energy bars that are higher in fat and lower in carbs than most other snacks. The high fat content in these bars means they're great for satiating appetite, though it might also help that this bar has a soft dessert-like texture and is studded with chocolate chips and almonds. Get a pack of 12 from Amazon for $39.97. 5. These 60% dark chocolate-covered macadamia nuts that are high in unsaturated, healthy fats. Endorphin-boosting dark chocolate and filling almonds are the ideal match for a snack meant to refuel both body and mind. Pack a handful in a Ziploc bag and you're good to go. Get a one-pound bag from Nuts for $15.99. 6. These classic Gu energy gels that no marathon runner can do without. It's impossible to make a list of snacks for endurance athletes without including Gu gel. Specially formulated for ultra-marathoners, each pack is stuffed with electrolytes and carbohydrates that can be rapidly absorbed. Eat a Gu before a long training session, and then keep up your energy by squeezing another one in every 30-45 minutes of training. Get a pack of 24 from Amazon for $31.32. 7. 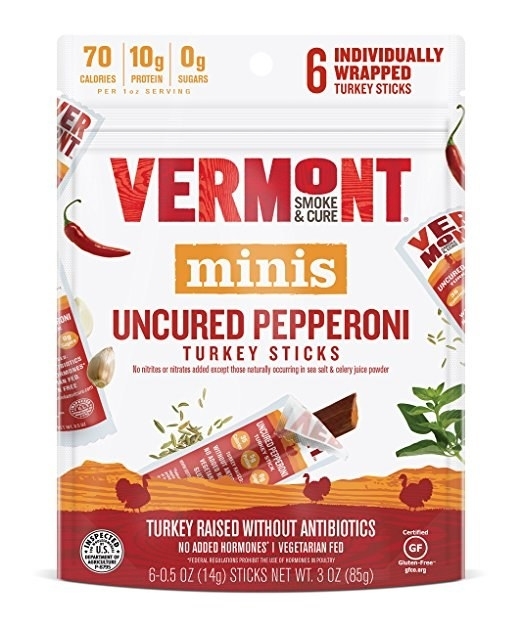 These Vermont Smoke & Cure mini meat sticks that are an easy way to work more protein into your diet. Is your life's purpose to sneak in as much protein into every food as possible? 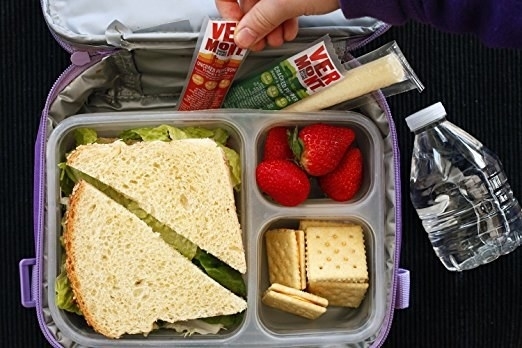 Then you probably need these meat sticks, which pack five grams of protein into each teeny serving and are great for on-the-go energy. Get a pack of six from Amazon for $3.94. 8. Or these Salmon and Smoked Maple bars that are a good option for pescatarians. If you'd prefer fish over turkey, you could also grab one of these salmon bars. It'll support in muscle recovery and fill you up. Get a pack of 12 from Amazon for $25.36. 9. These chocolate sea salt RX bars made with ingredients you can actually pronounce. You can't deny the value of a bar that lists just six or eight ingredients. When you've worked hard, you can feel the impact of every ingredient you put into your body, and there's something so reassuring about chowing down a bar that contains zero added sugar or mysterious ingredients you can't pronounce. Promising review: "This is definitely good for runners and endurance folks. My bodybuilding people would not approve of the carbs from the dates but I love the energy it gives me that lasts well until lunch." —Beth M.
Get a pack of 12 from Amazon for $22.69. 10. These peanut butter crunch Clif bars that are the perfect combination of crunchy, nutty, and smooth. Made with filling peanut butter, these bars feel satisfyingly satiating after even the longest bike rides. They also don't take up too much space in your jacket, so you can pack a few to-go. Get six from Amazon for $5.49. 11. This Iconic chocolate truffle protein shake that will hydrate and energize you. You can't deny the satisfaction of a slightly sweet, super hydrating shake after a sweat-pumping workout. This one has less chemicals than your standard protein beverage and packs just 130 calories per serving. Get a pack of 12 from Amazon for $33.99. 12. This dark chocolate and coffee trail butter that's minimally processed and easy to pack into your hiking gear. When you're on a physically demanding run or hike, the last thing you want to eat is a high-maintenance snack that will kick your digestion into overdrive. These smooth trail butters are both easy to consume and a delicious way to power your body with healthy fats. Get a pack of six for $33.99. 13. This dessert-like Honey Stinger salted waffle that'll motivate you on all your workouts. Some power snacks get a bad rep for tasting plain, or having boring textures. 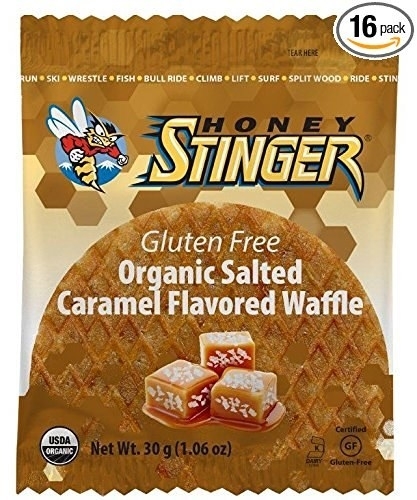 That's not the case with these Honey Stingers, which are basically less sugary versions of Dutch stroopwaffels. Get a pack of 16 for $19.07. 14. These Sport Beans that are a solid alternative to Gu gel packs. If you're looking for a snack that you can nibble on in bursts, then these nutritionally packed beans are probably your best choice. Unlike your usual jelly beans, these are filled with electrolytes to maintain fluid balance, plus Vitamin C to protect against oxidative damage. Get a pack of 24 from Amazon for $34.65. Some responses may have been edited for length or clarity.